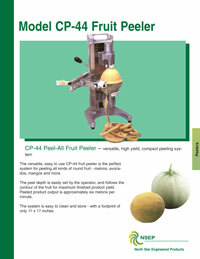 Fruit Peeler Model: CP-44 | Peels Melons, Avocados, Mangoes & More! 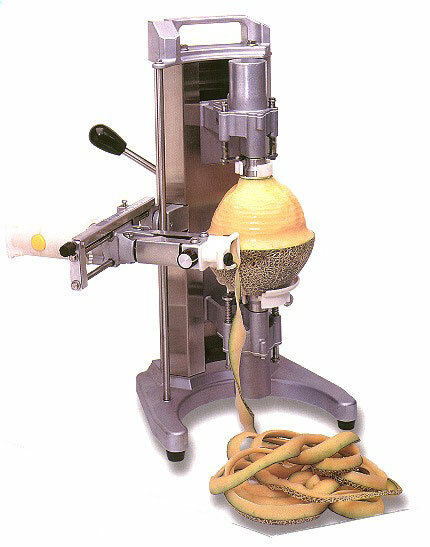 The versatile, easy to use CP-44 fruit peeler is the perfect system for peeling all kinds of round fruit - melons, avocados, mangos and more. The peel depth is easily set by the operator, and follows the contour of the fruit for maximum finished product yield. Peeled product output is approximately six melons per minute. The system is easy to clean and store - with a footprint of only 11 x 17 inches.